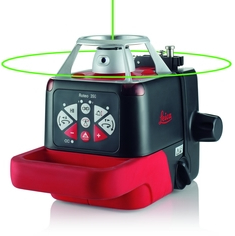 Leica is proud to announce the release of the new extended Leica Roteo rotating laser levels product line. The Leica Roteo Rotating Laser Line now has 3 new additions to the family, including Leicas first Green Beam Rotary Laser. Each laser has different settings and accessories specifically designed for different applications around the work site. The new Lasers include the Leica Roteo 20HV, Leica Roteo 25H, Leica Roteo 35 WMR and the fantastic Leica Roteo 35G Green Beam. The Leica Roteo Rotary Laser is ideal for many different interior and exterior applications such as, drop ceilings, framing, installing dry wall, laying pipes, grading, cabinetry, and many more. The Roteo is built for superior accuracy and reliability and has an IP54 rating. The Auto leveling feature saves time and insures accuracy and can compensate for tilts of up to 4.5. The Roteo Lasers have a reputation for being easy-to-use, jobsite tough, accurate and reliable. Some of the features on the expanded Roteo line include a new housing design, remote control and a motorized wall mount. The new sturdy house features an aluminum cage to protect the laser head and an easy grip handle. Remote control can be accessed through the laser receiver and key chain remote device. The remote controlled motorized wall mount is ideal for installing drop ceiling. Not only does remote access to the motorized mount save you time but keeps you safer. Leica new Rotary Lasers also include the Leica Roteo 35G which is Leicas first green Rotary laser. Green Rotary lasers have become popular due to their high visibility in bright conditions and over long distances. The green laser beam is 4 times more visible to the human eye than the red laser beam. We are an Authorized Leica Geosystems Dealer and can advise on the best product for your business requirements. For more information and to purchase the new Leica Roteo 35G >> or call 0800 292 2188 for advice from one of the team.